The Story of the Three Apples is an excellent example of The Unreliable Narrator, published in The Thousand and One Nights, vol. I (1912), translated from the Arabic by Edward William Lane. They say to me, Thou shinest among mankind, by thy knowledge, like the moonlight night: But I answer, Abstain from thus addressing me, since there is no knowledge without power: For if they would pawn me, and my knowledge with me, and all my papers and inkhorn too, For one day's food, they would never find the pledge accepted to the day of judgment. As for the poor, and his condition, and his whole life, how full of trouble! In the summer he fails to earn his food, and in winter he warms himself over the fire-pot. The dogs follow him wherever he goes, and any reviler, and he cannot repel him. If he states his case, and proves himself wronged, the judge will not admit his plea. Such, then, being the poor man's life, his fittest place is in the burial-ground. The Khaleefeh, when he heard his recitation, said to Jaạfar, Observe this poor man, and consider these verses; for they indicate his necessity. Then approaching the man, he said to him, O sheykh, what is thine occupation?—O my master, answered the old man, I am a fisherman, and have a family to maintain, and I went forth from my house at noon, and have remained until now, but God hath allotted me nothing wherewith to obtain food for my household; therefore I have hated myself, and wished for death.—Wilt thou, said the Khaleefeh, return with us to the river, and station thyself on the bank of the Tigris, and cast thy net for my luck? If thou wilt do so I will purchase of thee whatever cometh up for a hundred pieces of gold.—The fisherman rejoiced when he heard these words, and said, On my head be your commands: I will return with you.—So he went again to the river, and cast his net, and, having waited till it sank, drew the cords, and dragged back the net, and there came up in it a chest, locked and heavy. When the Khaleefeh saw it, he felt its weight, and found it to be heavy; and he gave a hundred pieces of gold to the fisherman, who went away, while Mesroor, assisted by Jaạfar, took up the chest, and conveyed it, in company with the Khaleefeh, to the palace, where they lighted the candles, and placed the chest before the Khaleefeh. Jaạfar and Mesroor then broke it open, and they found in it a basket of palm-leaves sewed up with red worsted; and they cut the threads, and saw within it a piece of carpet, and, lifting up this, they found beneath it an izár, and when they had taken up the izár they discovered under it a damsel like molten silver, killed, and cut in pieces. When the Khaleefeh beheld this, tears ran down his cheeks, and, looking towards Jaạfar, he exclaimed, O dog of Wezeers, shall people be murdered in my time, and be thrown into the river, and become burdens upon my responsibility? By Allah, I must retaliate for this damsel upon him who killed her, and put him to death!—Then said he to Jaạfar, By the truth of my descent from the Khaleefehs of the sons of El-'Abbás, if thou do not bring to me him who killed this woman, that I may avenge her upon him, I will crucify thee at the gate of my palace, together with forty of thy kinsmen! And the Khaleefeh was enraged.—Grant me, said Jaạfar, a delay of three days.—I grant thee the delay, replied the Khaleefeh. Jaạfar then went forth from his presence, and took his route through the city, sorrowful, and saying within himself, How shall I discover him who killed this damsel, that I may take him before the Khaleefeh? And if I take to him any other person, he will become a weight upon my conscience. I know not what to do.—For three days he remained in his house, and on the fourth day the Khaleefeh sent to summon him, and, when he had presented himself before him, said to him, Where is the murderer of the damsel?—O Prince of the Faithful, answered Jaạfar, am I acquainted with things hidden from the senses, that I should know who is her murderer? The Khaleefeh, incensed at this answer, gave orders to crucify him at the gate of his palace, and commanded a crier to proclaim through the streets of Baghdád, Whosoever desireth to amuse himself by seeing the crucifixion of Jaạfar El-Barmekee, the Wezeer of the Khaleefeh, and the crucifixion of his kinsmen, at the gate of the Khaleefeh's palace, let him come forth and amuse himself.—So the people came forth from every quarter to see the crucifixion of Jaạfar and his kinsmen; and they knew not the cause of this. The Khaleefeh then gave orders to set up the crosses; and they did so, and placed the Wezeer and his kinsmen beneath, to crucify them, and were awaiting the Khaleefeh's permission, while the people wept for Jaạfar and his relatives. But while they were thus waiting, a handsome and neatly-dressed young man came forward quickly through the crowd, and, approaching the Wezeer, said to him, Safety to thee from this predicament, O chief of Emeers, and refuge of the poor! It was I who killed the woman whom ye found in the chest: kill me therefore for her, and retaliate her death upon me.—When Jaạfar heard these words, he rejoiced for his own deliverance, and grieved for the young man: but while he was speaking to him, lo, an old sheykh pressed hastily through the crowd to him and the young man, and, having saluted them, said, O Wezeer, believe not the words of this young man, for no one killed the damsel but myself; therefore retaliate her death upon me. The young man, however, said, O Wezeer, this is an old man, imbecile through age; he knoweth not what he saith: it was I who killed her; avenge her therefore upon me.—O my son, said the sheykh, thou art young, and wilt find pleasure in the world; and I am old, and satiated with the world: I will be a ransom for thee and for the Wezeer and his kinsmen; and no one killed the damsel but myself: by Allah, therefore, hasten to retaliate upon me. Know, O Prince of the Faithful, that this damsel was my wife, and the daughter of my uncle: this sheykh was her father, and is my uncle. I married her when she was a virgin, and God blessed me with three male children by her; and she loved me and served me, and I saw in her no evil. At the commencement of this month she was attacked by a severe illness, and I brought to her the physicians, who attended her until her health returned to her; and I desired them to send her to the bath; but she said to me, I want something before I enter the bath, for I have a longing for it.—What is it? said I. She answered, I have a longing for an apple, to smell it, and take a bite from it. So I went out immediately into the city, and searched for the apple, and would have bought it had its price been a piece of gold: but I could not find one. I passed the next night full of thought, and when the morning came I quitted my house again and went about to all the gardens, one after another; yet I found none in them. There met me, however, an old gardener, of whom I inquired for the apple, and he said to me, O my son, this is a rare thing, and not to be found here, nor anywhere except in the garden of the Prince of the Faithful at El-Baṣrah, and preserved there for the Khaleefeh. I returned therefore to my wife, and my love for her so constrained me that I prepared myself and journeyed fifteen days, by night and day, in going and returning, and brought her three apples which I purchased of the gardener at El-Baṣrah for three pieces of gold; and, going in, I handed them to her; but she was not pleased by them, and left them by her side. 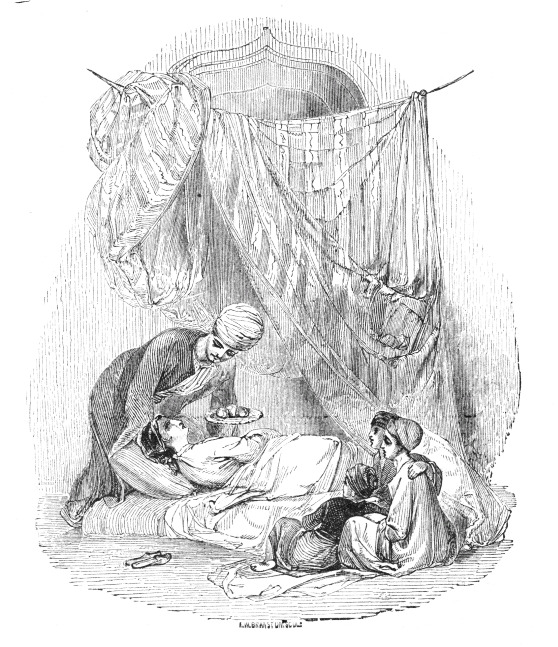 She was then suffering from a violent fever, and she continued ill during a period of ten days. After this she recovered her health, and I went out and repaired to my shop, and sat there to sell and buy; and while I was thus occupied, at mid-day there passed by me a black slave, having in his hand an apple, with which he was playing: so I said to him, Whence didst thou get this apple, for I would procure one like it?—Upon which he laughed, and answered, I got it from my sweetheart: I had been absent, and came, and found her ill, and she had three apples; and she said to me, My unsuspecting husband journeyed to El-Baṣrah for them, and bought them for three pieces of gold:—and I took this apple from her.—When I heard the words of the slave, O Prince of the Faithful, the world became black before my face, and I shut up my shop, and returned to my house, deprived of my reason by excessive rage. I found not the third apple, and said to her, Where is the apple? She answered, I know not whither it is gone. I was convinced thus that the slave had spoken the truth, and I arose, and took a knife, and throwing myself upon her bosom, plunged the knife into her: I then cut off her head and limbs, and put them in the basket in haste, and covered them with the izár, over which I laid a piece of carpet: then I put the basket in the chest, and, having locked this, conveyed it on my mule, and threw it with my own hands into the Tigris. And now, continued the young man, I conjure thee by Allah, O Prince of the Faithful, to hasten my death in retaliation for her murder, as I dread, otherwise, her appeal for vengeance upon me on the day of resurrection:9 for when I had thrown her into the Tigris without the knowledge of any one, I returned to my house, and found my eldest boy crying, though he knew not what I had done to his mother: so I said to him, What maketh thee cry?—and he answered, I took one of the apples that my mother had, and went down with it into the street to play with my brothers, and a tall black slave snatched it from me, and said to me, Whence came this to thee? I answered him, My father made a journey for it, and brought it from El-Baṣrah, for the sake of my mother; for she is sick: he bought three apples for three pieces of gold:—but he took it from me and beat me, and went away with it; and I am afraid that my mother may beat me on account of the apple.—When I heard my son's story, I discovered that the slave had forged a lie against the daughter of my uncle, and found that she had been killed unjustly; and as I was weeping bitterly for what I had done, this sheykh, my uncle and her father, came to me, and I informed him of the event; and he seated himself by me, and wept. We wept until midnight, and continued our mourning for her five days, ceasing not to the present day to bewail her death. By the honour of thine ancestors, therefore, hasten my death, to retaliate her murder upon me. The Khaleefeh wondered at the young man's story, and said, By Allah, I will not put to death any but the wicked slave; for the young man is excusable. Then looking towards Jaạfar, he said to him, Bring before me this wicked slave who hath been the cause of the catastrophe; or, if thou bring him not, thou shalt be put to death in his stead. So the Wezeer departed weeping, and saying, Whence shall I bring him? Not every time that the jar is struck doth it escape being broken! I have no stratagem to employ in this affair: but He who delivered me in the first case may deliver me in the second. By Allah, I will not go out from my house for three days; and the Truth, whose perfection be extolled, will do what He willeth!—So he remained in his house three days, and on the fourth day he caused the Ḳáḍee to be brought, and made his testamentary arrangements; and as he was bidding farewell to his children, and weeping, lo, the messenger of the Khaleefeh came and said to him, The Prince of the Faithful is in a most violent rage, and hath sent me to thee; and he hath sworn that this day shall not pass until thou art put to death if thou do not bring to him the slave. On hearing this, Jaạfar wept, and his children wept with him; and when he had bidden them all farewell except his youngest daughter, he approached her for the same purpose. 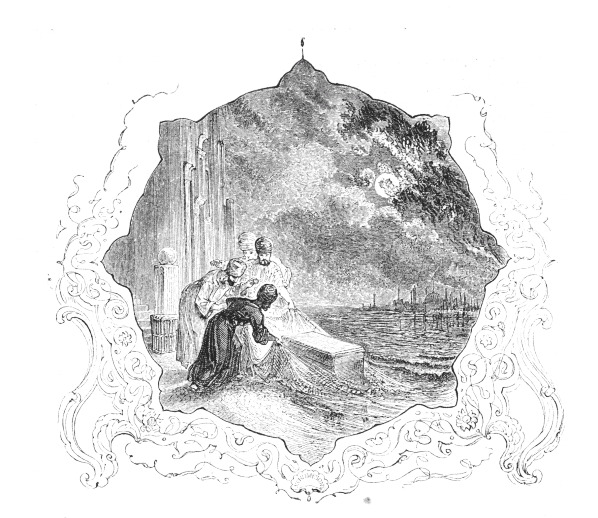 He loved her more than all his other children; and he pressed her to his bosom, and wept at the thought of his separation from her; but, in doing this, he felt something round in her pocket, and said to her, What is in thy pocket? She answered, O my father, it is an apple; our slave Reyḥan brought it, and I have had it four days; he would not give it me until he had received from me two pieces of gold.—At this mention of the slave and the apple, Jaạfar rejoiced, and exclaimed, O ready Dispeller of trouble!—and immediately he ordered that the slave should be brought before him. He was therefore brought in, and he said to him, Whence came this apple?—O my master, he answered, I went out five days ago, and, entering one of the by-streets of the city, I saw some children playing, and one of them had this apple: and I snatched it from him, and beat him; and he cried, and said, That belongs to my mother, and she is sick: she wanted my father to bring her an apple, and he made a journey to El-Baṣrah, and brought back for her three apples which he bought for three pieces of gold; and I took this to play with it:—then he cried again; but, paying no regard to him, I took it away and brought it hither; and my little mistress bought it of me for two pieces of gold.—When he heard this story, Jaạfar was filled with wonder at discovering that this distressing event, and the murder of the damsel, had been occasioned by his slave; and he took the slave and went with him to the Khaleefeh, who ordered that the story should be committed to writing, and published. Add The Story of the Three Apples to your own personal library.